Secured Footlock event. All spectators had their eye on me as I was the last competitor for the day. Before starting the event, I told the crowd that the objective for me was to break my own record because I had never touched that bell 15 meters above me. The journey seems endless when my heads up looking at the bell. All I can hear is the cheer and the support that kept me going when I was about to give up. ‘DING’, the entire crowd when crazy about it. I received hugs, applause and encouragement from the crowd when I came down and that was really good fun. It was my very first attempt to compete this event and it was done in less than one minute. Weeks ago, I received an invitation from Singapore Arboriculture Society (SAS) if I am interested to participate in the Asia Pacific Tree Climbing Competition (APTCC) 2014 in Cairns, Australia. My reply was: why not? Taking out time from my busy schedule, I start to go jogging, cut down on drinking, go for yoga classes, watching videos from previous competition, planning my gears and get guidance from experienced climber here in Singapore. It was a time juggle between training for skills and stamina, work, family and other regular commitment. The 3 weeks preparation did drove me to be discipline towards a set of fixed committed time. The Singapore Team had our gears check when we arrived at the event site. While Rick was organizing with the judges, Lee and I ensured that all of our gears were in good working conditions and qualify the competition requirements. The competition rules were set and reviewed constantly by ISA. In the 5 event stations, I gained different experiences. During the Singapore Tree Climbing Competition 2013 (STCC), I have been ambitious on gaining points at the Throwline event but I received zero. After studying the scoring system, I made a strategy to score at least one confident target for APTCC, and I did! The biggest take back for this event was to remain calm and relax, but focus. The APTCC organization made the Aerial Rescue event very realistic to factual work. Not realizing that if I were to borrow ropes and ascenders from other participants, it will not suit my climbing style and may cause accident instead of competition. I did not bring my usual ropes. The gear I had was not ready for this event and it had to be thought about when getting back to Singapore for work and improve on it. Belayed Speed Climb event was one of the most entertaining stations. It relates stories from the elderly tree worker in Singapore when they said that they didn’t have any safety harness when they climb trees in the past. Again, it was also about cheering each other in this station and had made the event in high-spirited. Be it fated, I was in the same group with the 2 times World Champion from New Zealand. This allows me to move in-group with him, witnessed his skills and get advice from him. Before starting the Work Climb event, both of us were on the tree and he advised me: be calm. Although the trees species in Cairns are not much of a difference with Singapore, I didn’t do better than my previous competition. I was looking out where the bell was during the competition instead of knowing where and how I should access to it before start. In the past, I strongly believed in: lets get up there and will know better what to do. This event proves me wrong. The best 3 scored climbers from APTCC will enter a Masters’ Challenge. It had a different set of tasks to be completed. I was very honored able to witness the world-class climbers performing live. 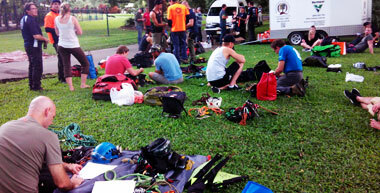 The champion will represent Asia Pacific region to compete in the International Tree Climbing Competition (ITCC). As a novice climber, there was fear in me that I will not able to do it, I will lose face, I will make myself like a clown when I am not doing well. I fear because I am competing with world-class climber. I previously wanted to train and climb by myself until I am good, then enter the event. The purpose: to win. In fact, there is something so special with tree climbers is that everyone encouraged each other, giving pointers when one is competing, building comradeship, encouragement and willing to share knowledge. I put the fear aside, knowing that I participate this event for another reason. To learn, experience, have fun and make friends. There was a good mix age of climbers from the region. I spotted the young climbers in their early 20s entering the industry and had passion with pride on what they are doing. The lady climbers absolutely convinced me that gender is not a barrier in the work but it’s the attitude. Organizer for APTCC 2014 had showcased a well planned total event, integrating logistic such as set up, schedule, sponsors, industry out reach, volunteers, and networking opportunity. Yes, I have done it, did it. After reading this, pick up a throw bag and do what a real arborist should be doing, with a right attitude. I would like to thank Singapore Arboriculture Society and San Lim Transport & Construction Pte Ltd for the support and giving me this chance of my lifetime in this event. It parked a chapter of my life story for my grand children to read.